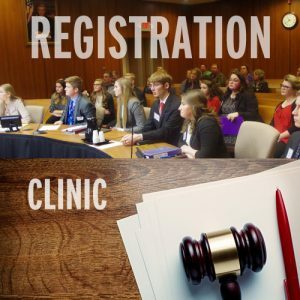 Students and coaches are invited to come and work on their courtroom skills under the guidance of experienced trial attorneys, law professors, and tournament judges. Sessions will be offered for mock trial participants both new and experienced participants. This year’s clinic will include a tour of the Michigan Supreme Court Learning Center and, if scheduling permits, a visit to the Michigan Supreme Court Chambers! We are also expanding to offer Courtroom Artistry and Courtroom Journalism. All attendees must register and pay the $10 registration fee. Lunch and learning materials will be provided. Please communicate any food or accessibility accommodations required. Student teams must be accompanied by a school authorized adult. Please type the participant's name as it should appear on a program. Use the "Notes" field to enter a grade level if they are a student, or clarify their role if "Other" is selected. Yes, I understand and accept the terms of this release. Yes, I understand and agree to the code of conduct. If you are paying Online, please click on the product link below and add the appropriate number of participants before checking out. Thank You!